Yawn ! So what’s the point other than you feeling important ? G’night fella. No your response about him putting his name everywhere says most, anybody with sense realises it’s so he can invest to his maximum levels. 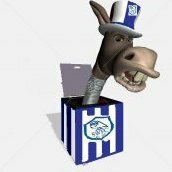 I couldn’t give a throw about away fans, we’ve had to pay well over the odds in the past and as far as the stripes go I too would love them back but given the way the recent kits have sold it would suggest it’s just us keyboard warriors that moan, get over it and get behind your club, lock, stock and leaky barrel ! Yeah you’re so right, we could have had that Madmantoff or whatever his name was, that would have been reyt good wouldn’t it ! FFS. Be carefull what you wish for! You mean when we had Carlos trying to work a compo package so he could move jobs ? Who says he is! Chansiri has admitted he got his strategy wrong so what’s your beef, he tried, gorrit wrong and is now trying something different, I’d rather he tried than did nowtso as I said what’s your real beef with him ? Chairmen like anybody should be open to scrutiny and debate ! It’s just that Rickygoo has it wrong this time..
Like most clubs have never seen 3 defeats in a week ? Reyt ! The issue was Chansiri’s loyalty and trust in Carlos but then can you really blame a boss for trusting someone he thought was right ? Who does ? But he has invested more in our club and infostructure than anyone else, yes he has his name and “aledged” brands everywhere but that is so he can put more money in, more money than Milan could dream of. Yet at half time the BBC PUNDITS CLAIMED WE WERE THE BETTER TEAM ! DC tried one way, it hasn’t worked, he accepted that, he now has to try a different way! Get over it ! Eh ? not sure which of us has drunk too much tonight ! I really hope there’s a positive reaction after tonight. Oh FFS ! Gerra feckin grip can’t you ? But many with far wealthier owners than DC didn’t and many of those have been around a lot longer than DC so what’s yer point other than to stir it ? Could we benefit from relegation? In one word and to save time NO !